The Gefen EXT-DVI-1600HD is a DVI/HDMI Extender System which is for extending and managing control systems at great distances. The Gefen EXT-DVI-1600HD sends DVI or HDMI, Audio, and RS232C signals up to 300m away when used with DVI at 1920x1200 and up to 2km when used with DVI at lower resolutions. It maintains HD video signals up to 1920x1200 with computers and 1080p with HD equipment. Additionally, extension of RS232 signals helps create long-distance control systems for AV integration or touch-panel systems. The Gefen EXT-DVI-1600HD system uses a send-and-receive methodology. The DVI/HDMI/Audio/RS232C source devices are plugged into the Sender module. At the Receiver, remote devices (including an HD display) plug into the Receiver module. The proper length of fiber optic cable is connected at both ends. Power supplies for the modules are plugged into wall sockets and a crisp vibrant HD picture results. Note: This device fully supports Display Data Channel (DDC) and High-Bandwidth Digital Content Protection (HDCP) when the front panel switch on the sender module is selected to HDMI. The Gefen EXT-DVI-1600HD uses a DVI connector for video. HDMI can be sent by using adapters or combo cables to provide DVI video with external digital audio as combined input to the EXT-DVI-1600HD Sender unit. The result will be HDMI with embedded audio at the Receiver end. The digital input jacks can only support D-PCM or PCM stereo audio formats. 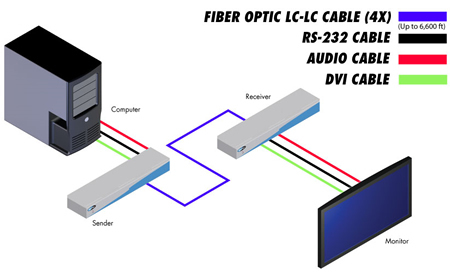 Question: Please send me a fiber extender information that can connect 2 pcs. The pcs are in rack and monitors are on desk 30 feet away. Answer: Thank you for your inquiry. Please contact your KVM Switches Online representative at 1-877-586-6654 to discuss your project in greater detail.